Auguste Lumière was born on October 19, 1862, and Louis Lumière was born on April 10, 1864, both in Besançon, France. At school in Lyons, the boys excelled in science and upon completion of secondary education joined the family’s photography business. Their father encouraged their attempts to improve upon existing photographic technology. By 1880 they had devised a dry plate that improved the quality of commercially developed film, and two years later Louis opened a factory for manufacturing the plates. In 1894 the boys’ father witnessed a presentation of American inventor THOMAS EDISON’s kinetoscope, an early motion­ picture machine introduced in 1887. Informed of this device, the Lumière brothers were inspired to design a machine that would combine animation with projection (Edison’s kinetoscope lacked a built ­in projection mechanism). They patented their resulting cinèmatographe, from which the term “cinema” is derived, in 1895. The machine involved celluloid film run through a projector at 16 frames per second and a semicircular shutter that dampened the light between the lens and the film. It was considerably smaller and lighter than Edison’s kinetoscope. On December 28, 1895, the brothers held the first demonstration of their invention at a Parisian café packed with a full audience, showing a short film called Quitting Time at the Luraière Factory and several other clips. By 1898 they and their staff had produced more than 1,000 short motion pictures, including newsreels, comedy shorts, and documentaries; however, they regarded their invention as a novelty and did not believe it to have much of a future. Louis continued with photography, devising an apparatus for producing panoramic shots and a process of using dyed starch grains for color printing. In his later years he experimented with stereoscopy and three­ dimensional films. He died on June 6, 1948, in Bandol, France. His brother Auguste died on April 10, 1954, in Lyons, France. 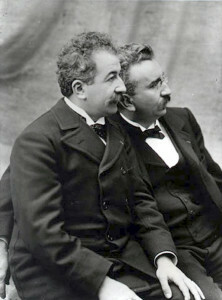 The Lumière brothers’ cinématographe marked the beginning of cinema, a revolutionary form of twentieth ­century entertainment and information. Although the Lumières failed to foresee the potential of their invention, cinema culture spread quickly. During the first decade of the twentieth century, most films were short, lasting 15 to 20 minutes, and were geared toward a public that could not afford to attend live theater. People became movie fans in the thousands around the world. In 1908 the United States had an estimated 10,000 movie houses, and as many as 250,000 people went to the cinema every day in New York City alone. Russia had 1,200 movie houses by 1910. The technology of cinema progressed rapidly as well. Animated cartoons, series of slightly altered drawings projected in rapid sequence, appeared in 1907. A major advance was related to sound; attempts at talking projections began in 1902 but were not fully successful until 1927, when the first sound movie The Jazz Singer was produced. Its sound source was a synchronized phonograph record. During World War I, newsreels took on a new importance that they were to retain after the war. People became accustomed to receiving real­ life moving images, and the demand for filmed news was established. From its beginning as a curious attraction, cinema has become a huge industry in the late twentieth century, involving hundreds of professional careers and billions of dollars per year. Posted on March 9, 2015 by Natalie. This entry was posted in Inventors. Bookmark the permalink.